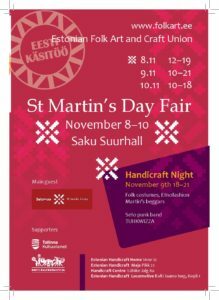 St Martin’s Day Fair is Estonia’s largest handicraft and folkloristic lifestyle event! Estonia’s best handicraft items are presented and sold at the fair, specialist workshops for handicraft lovers and crafts activities for children are organised. Demonstrations of handicraft products and presentations of new books take place. Visitors can eat Estonian traditional food and listen to various folk music groups. St. Martin’s Day Fair always takes place during the weekend closest to St. Martin’s Day (10 November) from Thursday to Sunday. The event culminates with a special Friday evening programme- the Handicraft Night. Welcome to St. Martin’s Day Fair!